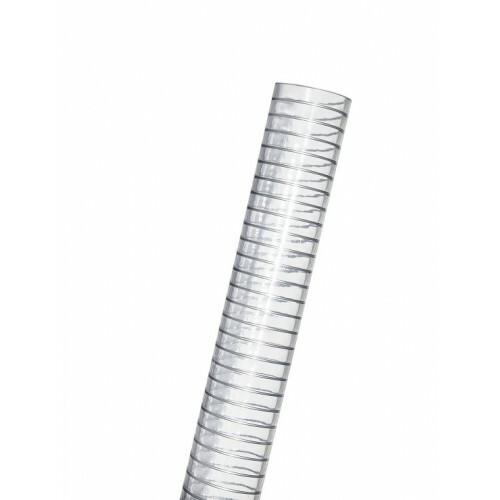 Technical Features: flexible hose made from ether-based hygienic TPU with AISI 302 stainless steel spiral. Inside and outside completely smooth to enhance flow properties and allow easy cleaning and sterilization processes. It can be electrically bonded by grounding the spiral, according to TRB S 2153. Properties: The extruded, low porosity TPU tube reduces permeation problems. Highly neutral in taste and odor, it preserves the organoleptic properties of the medium. Very good chemical resistance to acids and alkaline solutions and good impermeability. Versatile rubber resistant also to oils and fats under common use conditions. Without halogens. By grounding the steel spiral the hose is electrically bonded according TRB S 2153. The electrical resistance R ≤ 102Ohm/m is according to ISO 8031 - ATEX Directive 94/4/EC and 99/92/EC). Suction of powders and high abrasive granules. Ideal solution to convey pharmaceutical and cosmetic powders, pills, tablets of medicines; for food flours and grains, sugar, salt, dry fruit. Suitable also for food, pharmaceutical and cosmetic liquids with alcohol concentration up to max 20%.